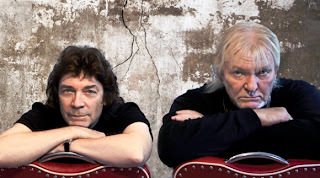 Chris Squire (Yes bassist) and Steve Hackett (Genesis guitarist) have conceived a remarkable progressive rock amalgamation entitled SQUACKETT. The CD A Life Within A Day will be officially released on May 28th and available for preorder at www.hackettsongs.com or amazon.com. Some of the bands many studio classics include Fragile, Close to the Edge, Tales from Topographic Oceans and Relayer. The album 90125 spawned the bands first and only #1 hit “Owner of a Lonely Heart” and became their most commercially successful album. Chris Squire recorded his first solo album in 1975 entitled Fish Out Of Water, and it quickly became a progressive rock masterpiece. Fans and critics alike had hoped for a follow-up release but it never transpired. The current lineup of ‘Yes’ features new frontman Jon Davidson (who recently replaced Benoit David), Steve Howe on guitar, Alan White on drums, Geoff Downes on keyboards and Chris Squire on bass. ‘Yes’ begins their American tour on July 13th with a show scheduled for Ruth Eckerd Hall in Clearwater, Fl. on July 29th and supported by Procol Harum. Steve Hackett is the guitar virtuoso for the legendary progressive rock group ‘Genesis.’ Hackett joined the band in 1971, a line-up that featured frontman Peter Gabriel, Tony Banks on keyboards, Mike Rutherford on bass and Phil Collins on drums and vocals. In 1976 Collins replaced Gabriel as lead vocalist. Some of the bands most innovative classics are Selling England by the Pound, A Trick of the Tail, Wind & Wuthering, Duke and Abacab. As with Chris Squire, Steve Hackett’s style of play has been emulated over the years by the finest musicians in the business. Genesis has sold more than 150 million albums worldwide and was inducted into the rock and roll hall of fame in 2010. SQUACKETT’s premier release A Life Within A Day is certainly a stunning blend of progressive rock matrimony and a magnificent duo of virtuosity. The harmonization of Squire and Hackett are inspiring and reminiscent to Crosby & Nash. I had the great pleasure of chatting with Chris Squire on Friday. Chris was on a well-deserved R&R break in Hawaii. We talked about Squackett, a possible follow-up to Fish Out of Water, and working with Jon Anderson again. Here’s my interview with legendary bassist/songster/songwriter/and YES co-founder/ Chris Squire. Ray Shasho: Chris, thank you for being on the call today …are you on the west coast? Ray Shasho: Are you living in Hawaii now? 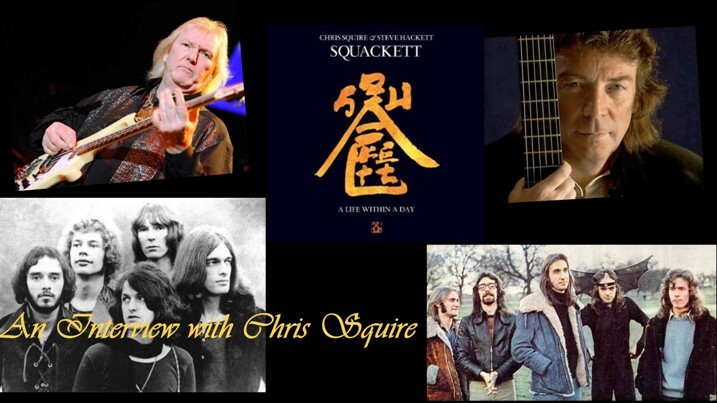 Ray Shasho: Chris, not only are we promoting Squackett today, but also the upcoming YES American tour which arrives in Clearwater, Florida on July 29th. But I must say two of my favorite albums have always been Fish Out Of Water (Chris Squire) and A Trick of the Tail (Genesis), so it would probably take an act of God for me not to like the new CD. Ray Shasho: I received a raw copy, no credits or front cover art work … which I really missed because YES and its member’s solo efforts have always generated the best artwork in the business. Ray Shasho: The collaboration between you and Steve Hackett was magnificent and I thoroughly enjoyed the CD. It seems to me that you guys also had a chance to spread your wings a little bit on this one too? Ray Shasho: Who played drums on the album? Ray Shasho: I also liked that sort of race car engine rev effect on the track …how was that created? Ray Shasho: The harmonies on many tracks from the album were also reminiscent of Crosby and Nash. Ray Shasho: The tune “The Summer Backwards” is a beautifully blended composition accenting both of your amazing voices. Ray Shasho: At the very end of “Divide Shelf” there’s an interesting melody that sounds like an old movie or wartime tune? Ray Shasho: What is the origin behind “Aliens” in which you say (Are only us from the future). Ray Shasho: I’ll admit Chris, when I was in high school; we all thought the members of YES may have been extraterrestrial. I told Jon Anderson this when I chatted with him too. Ray Shasho: Chris… Jon said good things about you guys in the interview. And I did ask him about not being in the band anymore. Ray Shasho: Back in August of 2011. Ray Shasho: I was heartbroken when Jon Anderson was no longer a part of YES. Ray Shasho: Back to Squackett and the new album …my favorite tune on the CD is “Can’t Stop The Rain.” Vintage Squire… sort of reminded me of Fish Out Of Water. Ray Shasho: The track fades into “Perfect Love Song,” the final cut on the album and a perfect ending to a superlative album. I know we’re running short on time …Fish Out Of Water was an absolute masterpiece. I was really surprised there wasn’t a follow-up release? Ray Shasho: Speaking of never say never … can Jon Anderson ever return to YES? Ray Shasho: How about Relayer II? That was recorded around the same time as Fish Out Of Water. Ray Shasho: Chris, thank you for being on the call today but more importantly for all the great music you gave us throughout the years. The new CD by SQUACKETT called A Life Within A Day is available for pre-order at www.hackettsongs.com or amazon.com. The official release is May 28th. Order Ray’s book ‘Check the Gs’ The True Story of an Eclectic American Family and Their Wacky Family Business at amazon.com, barnesandnoble.com or iuniverse.com Download on Kindle or Nook for only .99 cents!